Entrelac Scarf in 4 skiens of Patons SWS. Size 8 needles to make a denser fabric. Now if only fall would really get here so I can enjoy this beauty! 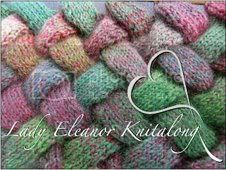 Pattern: Lady Elanor from Scarf Style, but with only 4 base triangles. At this point I have it memorized, with the exception of the last row, which I just made up as I went along since I was on a train without the book. Whoops. Ohh I love that! Did you use a pattern or just make it up? I just saw some Patons SWS at the store and HAD to pick up a couple skeins! oh man that is beautiful!! You AMAZE me with the knitting skills.